You might have already experienced virtual reality on your phone, or on a more complicated device like the Oculus. Until recently, the dream of the average creator making their own VR content was pretty much just that; a dream. 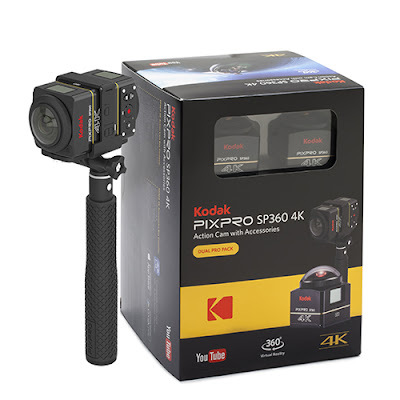 However, with the Kodak PixPro SP360 4K action cam rig, that dream can indeed become a reality... as we found out. In a nutshell, this is a pack that contains two Kodak PixPro SP360 4K action cameras, and the accessories and mounts to lash them together. You see, by doing so, and by then merging together the two separate footage files the cameras capture, you can create fully immersive 360 virtual reality videos. And, as the name suggests, you'll be able to do so in 4K, which is a pretty big deal. Filming that took no prep whatsoever, as the cameras come set to record in the optimum settings as default. All it took was to download the footage form the Micro SD Cards (not included) to the free Kodak PixPro Stitching software, link the two files together (our first attempt wasn't as successful as later tries), then upload the finished video to YouTube to enable the head-tracking required for full VR, or just the left-side cursor you can see in the embedded video here. Either way, you can pan around through the full 360 degrees. For footage slightly more exciting than a stream running through a York suburb, we went to Edinburgh for the day. First up, we scaled Arthur's Seat, the random mountain in the middle of the Scottish city. We did film some footage at the very peak, with the KodakPixPro SP360 4K cameras positioned on top of the summit marker stone itself. However, we cocked up massively and forgot to set both cameras recording, so instead please make do with this lovely still. Fortunately we did better job a few moments later, just on the side of the summit at the edge of a cliff. For this below video we set the cameras in their double mount and on top of the included telescopic selfie stick (using our own gorilla pod to stabilise it). Because of that, perspective is low, meaning if you're watching this through a VR viewer, it's best to sit on your bum to get the full effect. Oh, and remember to knock up the streaming quality to 4K! After climbing down the mountain (and taking a bloody well-earned rest) we climbed something else; The Scott Monument. The 280 steps were slightly more forgiving that the 251 metre height of Arthur's Seat, but the views were no less impressive. At the top of the monument we were able to test out an individual cam's photo capabilities, snapping a couple of selfies high above the streets of Edinburgh. As you can see, they're not joking about that 235 degree field of view, and we were massively impressed by the quality of the still image. And then we coupled the cams back together to grab yet more 360 footage. Again, use the cursor to pan around, or for far better results, pop you phone into a VR viewer and stick on some headphones. 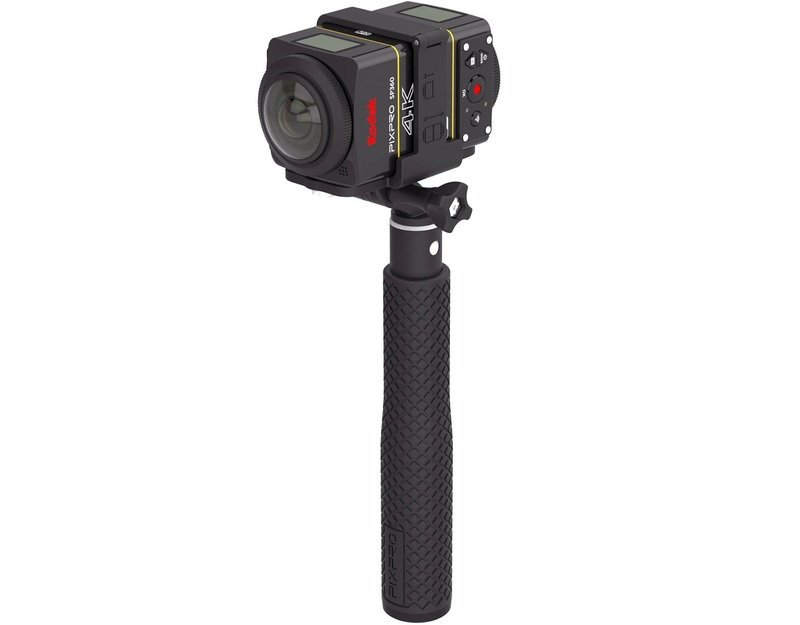 The kit includes the aforementioned double mount and selfie stick, as well as a wristwatch remote control (although the cameras also possess WiFi to be controlled by a smartphone app), handy lens covers, a carry case for the cams only, a charging cradle for the batteries, and a couple of other mounts. The emphasis is very much away from these small cameras being action cams, and more on the serious VR film-maker approach. That isn't to say that they should be treated with kid gloves though, as the individual unit itself is very robust and the dome-like glass lens bubble seems very tough. Some users have been brave enough to bolt theirs to a drone, top side and bottom side, to capture 360 flying footage. Nice. There is no doubt that online content will continue to shift toward 360 and VR entertainment, especially with the rise of VR headsets. Get in there at the ground level and start to create your own stuff right now, and the Kodak PixPro SP360 4K is a great way to begin. 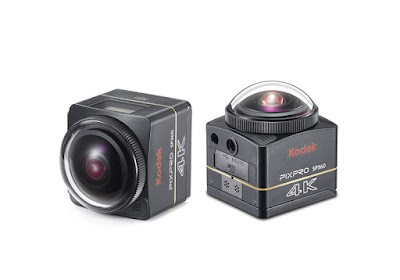 Yes, the kit is very expensive, but even buying one of these cameras to produce dome videos would be awesome. At the end of the day, these film in 4K, which is something that most other VR cameras can't yet do. Great fun, brilliant visuals, and surprisingly easy to master. If you can, check them out.